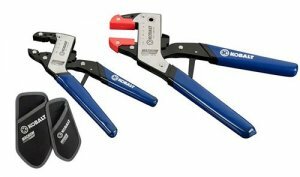 purchase the Magnum Grip pliers through Lowes.com. You might have seen the Kobalt Magnum Grip Pliers on a TV commercial where they boast that their pliers offer the adjustability of a tongue & groove plier but with the added feature of the jaws always remaining parallel. This means that the jaws have more contact with the nuts or bolts you are gripping, which is said to offer greater gripping power. The 2-piece set includes a 6-inch and an 8-inch Magnum Grip Plier. The 6-inch plier also features a v-notch jaw that better accepts hex, square, and round objects, while the 8-inch features removable rubber jaw covers for non-marring applications. I haven't used these pliers myself, but it has pretty good reviews from the Lowe website.